This essay examines the confluence of local and global dynamics, exploring how transnational migration affects and is affected by gender roles, kinship relations, intergenerational obligations, and ideologies of parenthood. Journeying to the Middle East repeated on two-year labor contracts, many of Sri Lanka’s migrant housemaids leave behind their husbands and children. Women’s long-term absences reorganize and disrupt widely accepted gendered attributions of parenting roles, with fathers and female relatives taking over household tasks. Migrants say that economic difficulties prompt migration, and assess commitment to kin in financial terms. The government also benefits from remittances. Nevertheless, stakeholders (villagers, politicians, and the national media) worry about the social costs born by children. 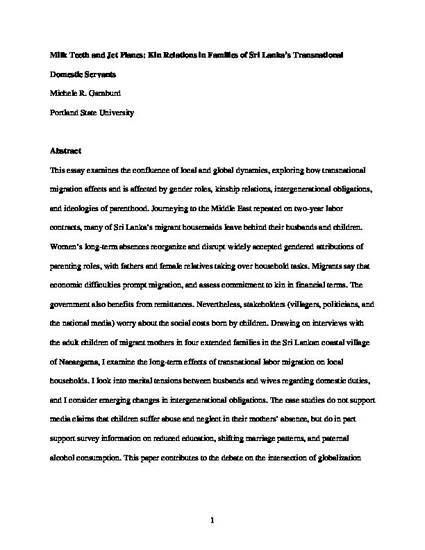 Drawing on interviews with the adult children of migrant mothers in four extended families in the Sri Lankan coastal village of Naeaegama, I examine the long-term effects of transnational labor migration on local households. I look into marital tensions between husbands and wives regarding domestic duties, and I consider emerging changes in intergenerational obligations. The case studies do not support media claims that children suffer abuse and neglect in their mothers’ absence, but do in part support survey information on reduced education, shifting marriage patterns, and paternal alcohol consumption. This paper contributes to the debate on the intersection of globalization and kinship studies, and explores the politics of representation at work in the discourse surrounding the social costs of migration.